Well, I got my first T8 ship bought with credits. I have not had to buy any T8 ships before as I got a free Kiev and Ognevoi from the RU DD line split and ARP Takao. Oh, and this was also part of my "Grind in X time" as I somehow got 3 days of premium 3 days ago and I decided to grind the 70k left on the Gneisenau. Next goal: Get the Independence so I can ALT attack again. I've just unlocked Bismarck myself the other day. Don't have the credits to buy her though. Nice, congrats! I'm working up to her myself in case she's useful for the upcoming campaign. Only ~60k left to go. For some reason I've been struggling with Bismarck in SEA server (i have secondary build but no manual sec or concealment expert, only AFT for now). Wait, there are ships above tier 7 that aren't bought with real money??? The ARP Takao is the only one that does not need to be bought with credits. 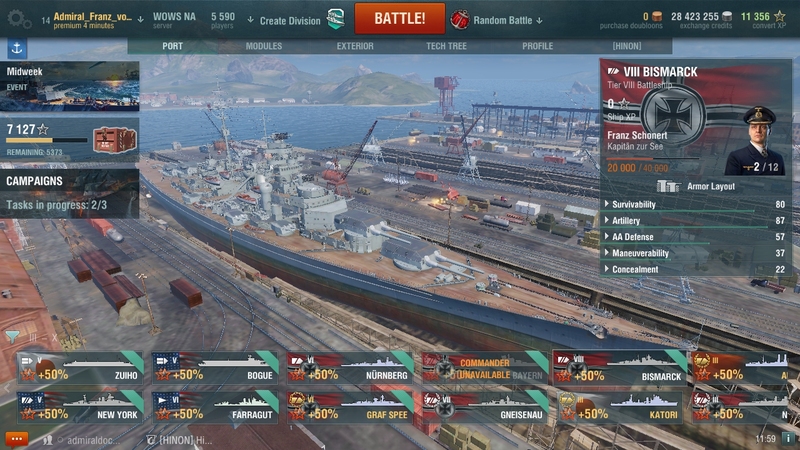 However, the distribution of ships with the RU DD split gave me the Kiev and Ognevoi for free. Good choice. Now get her set up for max secondaries. <-- Only has premiums at tier 8 and up. 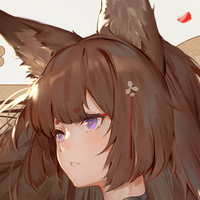 I'mma skreb that only marginally likes playing WG titles anymore, so I have like 5 or 6 lines at tier 7, but I don't really play them much because I have so many premiums at tier 7+ that I just rather play with those. Like when I think about playing my NiceCanoe, I end up playing with my ShinyHorse. When I think about playing my Yorck, Pepsi, or Myokou, I end up playing my Indy, Atlanta or ShinyHorse. Same story for my Colorado, I just play my Bama or MO. Really?? That's your first tier 8 for as much as you play this game I would have thought you had a few tier 10s by now. No, this is my third. I have the Kiev and Ognevoi over on the EU server. Edit: If you are just talking about NA, I am more spread out across tech trees here so I am mainly in the middle tiers. I also spent like 120 battles in the ARP Haguro. Oh, and this was also part of my "Grind in X time" as I somehow got 3 days of premium 3 days ago and I decided to grind the 70k left on the Gneisenau. 4 minutes of Premium left! Got it very last moment didn't you lol. I've been at it for a while too, and have never seen the utility in going past T8. The matches are less fun, and frankly the game play is stilted as costs are so high that everyone plays to save credits, hence, the bow on BB meta, add all the "paper" ships and it just does not have much appeal to me. I have ground several lines up to 8, but I don't even play my 8s much either. 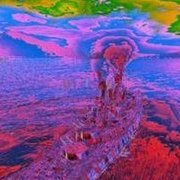 I enjoy my Bismarck it is an awesome ship. Beware of the many tier 9 and 10 ships you will be Matched against. The Bismarck will hold her own But at a price. Play her wisely and receive rewards of greatness. I am half way to tier 9 in German BB's. 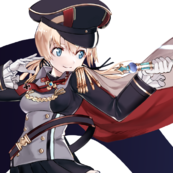 My Bismarck Capt. is temporarily in his training to 18 on the Scharnhorst. Yes, I milked the premium cow to the last before I bought the Biz. Grats! How did you get the Naval Base in daytime? With me it's always at night. Now me you a Gio will have to have fun with our new Bismarcks lol. Yup, now I have to get back to 40 mil credits. Congrats on the Bis. She is a fun ship. I really like her play. F der is a bit of a let down if you run the line, but the GK well makes up for the gap. Kind of like the diff between Amagi and Yam. Amagi fun as hell, as is Yam. Iz.. ugh... grind through that. I have an account here in NA but play in SEA primarily. Bismarck in SEA is really hard to play due to T10 MM and the fact that the BBs tend to play it safe by staying at about 15km-ish generally. Less brawling vs NA. I have more damage in Bismarck in NA. The Bismark is good. FDG was a bit of a let down at IX. Not a terrible ship, just never really felt that great. After I moved up to GK at X, was surprised to see I had a 56% win rate with the FDG. Didn't feel like it! Bismark is still the highlight for me since Tier VIII isn't full camp like IX and X.